Burberry, Louis Vuitton, Bergdorf Goodman—just a few of the most familiar names in the high-fashion world have also been around for over a hundred years. 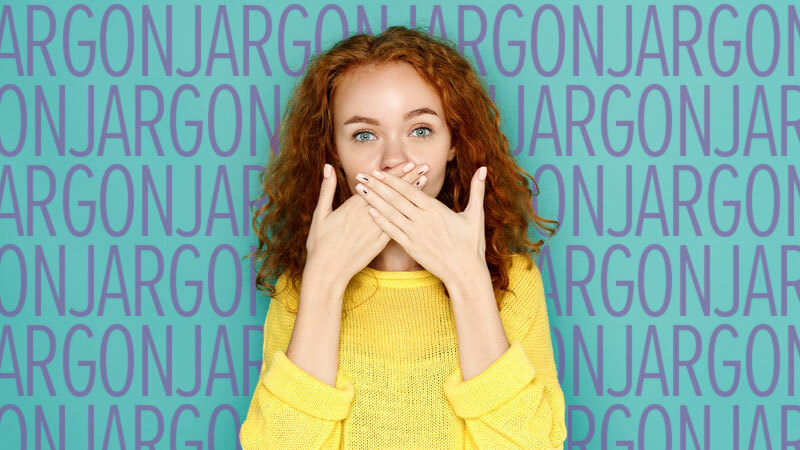 While brand names and brand heritage are important, in an-ever growing and competitive space, these well-respected brands have to fight harder to grab the attention of consumers in the digital age. So, how are some of the top fashion brands breaking through the clutter? Many have turned to content marketing to help tell their stories and create more engagement with their customers. Just in time for London Fashion Week (and right after New York Fashion Week), here’s a roundup of some luxury fashion names that have found high-polished success with content marketing. Known for their iconic trench coat, Burberry has been around for 157 years, making them one of the oldest luxury fashion brands in the marketplace today. Wanting a fresh approach and more engagement with younger generations, Burberry invested more than 60% of their marketing budget into digital, which helped lead to the creation of two buzzworthy digital projects—the Burberry Acoustic project and the Burberry Kisses project. 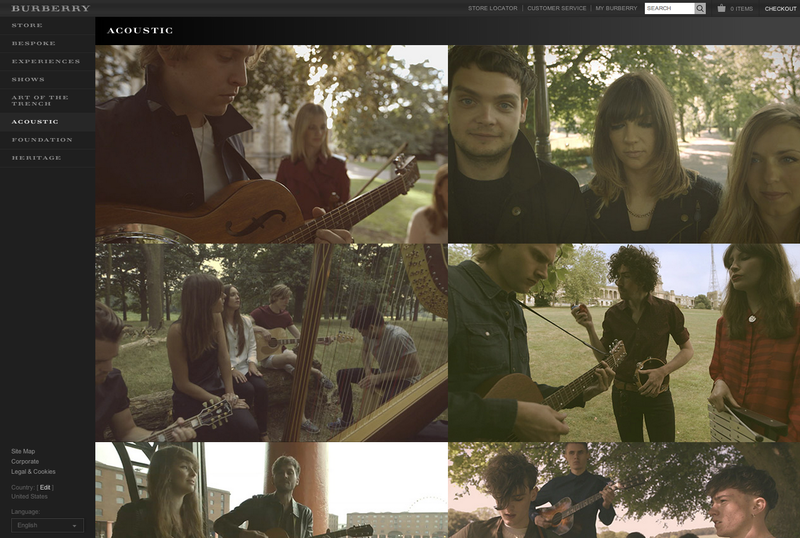 Screen capture of the Burberry Acoustic project. The Burberry Acoustic project, which began in 2010, features up-and-coming British musicians hand-selected by Burberry’s Chief Creative Officer, Christopher Bailey. A series of videos was created showing the artists performing acoustic versions of their songs in front of scenic, countryside backgrounds—which ties in with the imagery seen in some of their advertisements. The artists in the videos are wearing Burberry clothing, of course lending an air of hipness to the brand. The videos were pushed on several content channels: a Burberry Acoustic microsite, their YouTube channel and on their Facebook page. Many of these videos have over 100,000 views. Burberry also got some buzz this summer from their Burberry Kisses project. Partnering with Google, Burberry launched a website where consumers can use the webcams on their computers or the cameras on their phones to capture their unique kiss print. Users can then choose a lipstick (from the Burberry collection, of course) to doll up their kisses, which is then used to seal a digital letter featuring a note that they can write themselves. The letter is then sent to anyone of the user’s choosing. An added bonus, users can see their letter crossing over their local landscapes via StreetView technology while the letter makes its way to its final destination. Screen capture of the Burberry Kisses project. This interactive, personalized experience gives users a chance to have an emotional interaction with the Burberry brand. These projects, coupled with an increased digital presence, have helped Burberry achieve a rise in sales. Featuring longstanding luxury fashion brand (Louis Vuitton), the LVMH group has also been carefully crafting their digital presence with their Nowness.com site. 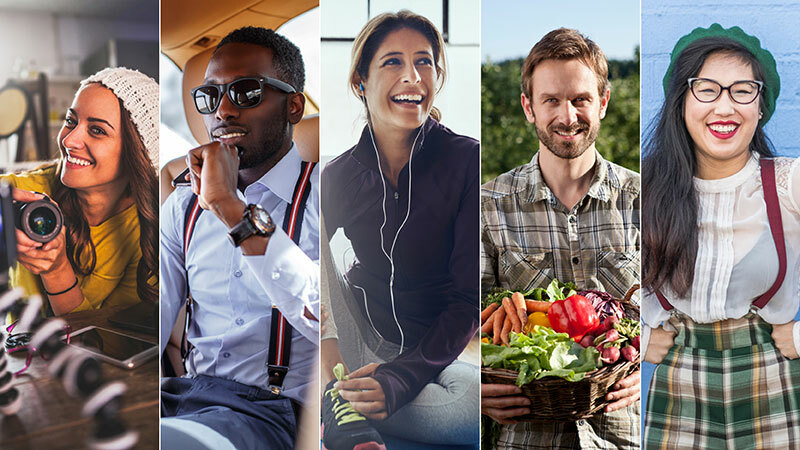 Launched in 2010, the website is meant to be a “daily resource for the culturally curious,” bringing together high-end culture experiences not only in fashion, but in a diverse range of topics, from music to sports to travel. (One post that struck my interest—a profile on Sasha Cohen, the 2006 Olympic gold medal-winning figure skater who has since disappeared from the limelight. In keeping with their luxury heritage, Nowness.com has a high-fashion feel, with a clean, simple design, originative photography and excellent writing. 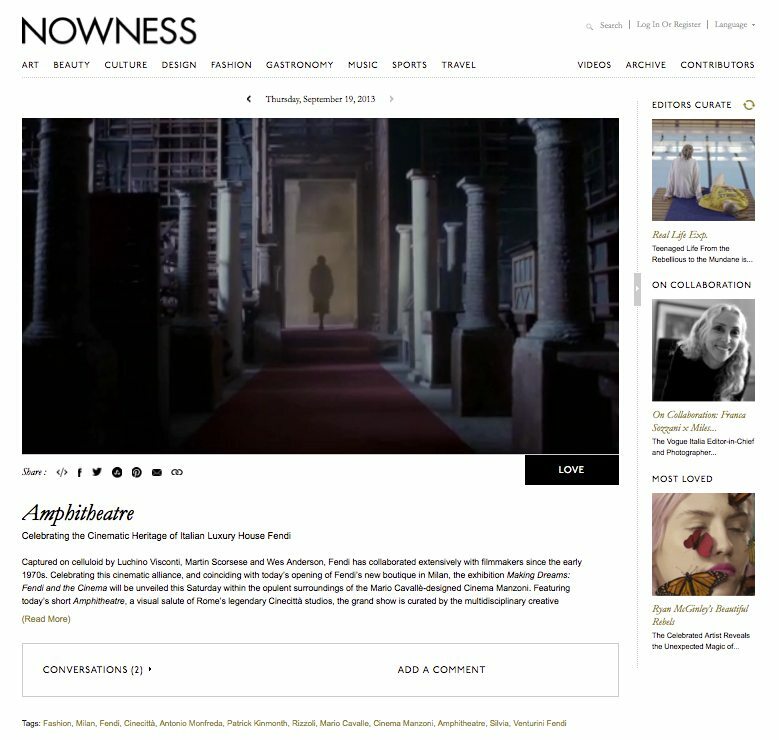 By covering a wide range of topics, Nowness.com embraces a larger audience of not just fashionistas, but anyone who desires to learn more about the topics covered. Posts are frequent and include video, interviews, quotes and photos, helping to tell the story of the LVMH brands and create a deeper engagement with consumers. 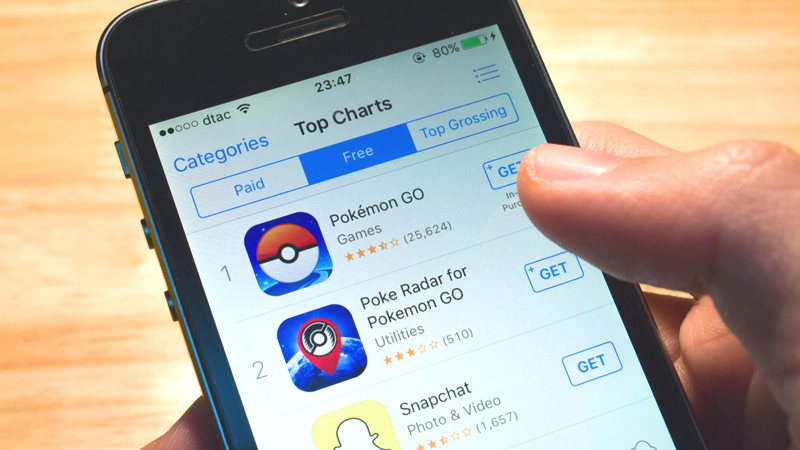 Nine channels are used to distribute the various forms of content, including Instagram, Foursquare and Pinterest. Continuing to expand their reach, a Chinese version of the site was launched in 2012. Content from Nowness.com can be seen in other global publications as well, such as The Huffington Post and the UK’s The Guardian online. The site has received a Webby Award for Best Fashion Website, a Clio Award for Best Interactive Website and Women’s Wear Daily Japan’s Best Fashion Media Award. Another brand using storytelling to engage with their consumer is Bergdorf Goodman. A high-end specialty retailer that first opened its doors in 1899, the retailer launched a blog named 5th/58th, the address of their New York City flagship store. It is meant to get the reader “as close to Bergdorf Goodman without actually being there.” The blog gives Bergdorf Goodman a way to connect with their shoppers to help them be seen not only as storefront, but a go-to resource for fashion news and advice. The blog is chockfull of fashion news, style tips and trends, as well as loads of behind-the-scenes features. Recaps of fashion events and interviews with popular designers, such as Carolina Herrera, give readers an inside look at what working in the fashion world is really like. One of the fun series on the blog is their “Closet Considered,” which showcases jaw-dropping, real closets in New York City (which just so happen to hold clothes that can be found at Bergdorf Goodman!). Other articles feature their top trends and favorite products, with carefully chosen product placements that fit naturally (not forcefully) into their articles. 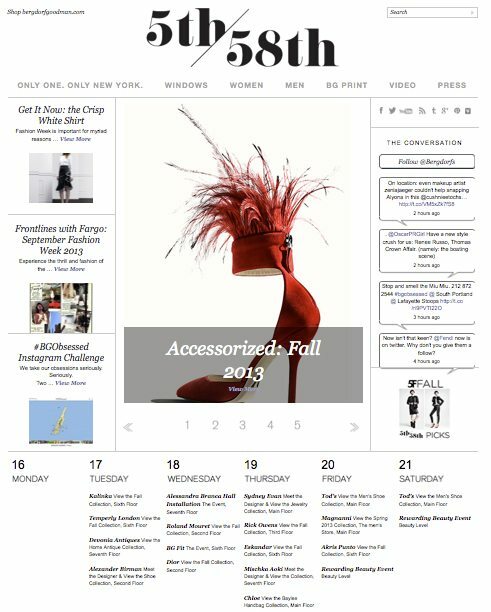 What are your favorite examples of content marketing in the high-fashion world? Let us know in the comments section below! We love to see new and innovative examples.